2017 is a special year for Scotland Motors because it marks the 50 year anniversary of the company. Harry Howell started Scotland Motors in 1967 with twelve cars. Today we have as many as 500 vehicles in stock at any given time. Harry came home one day to find young son, Harry "Lee" Howell, Jr.,playing with Matchbox cars, lining them up to make his own car lot. Harry saw that Lee had organized the cars by color (reds with reds, blues with blues, etc.) and he used the opportunity to teach Lee his first lesson about the car business: alternating the colors will make each car stand out. That was only the first of many lessons Lee learned from his father. Lee started working with his father as a young boy washing cars and eventually moved up to sales. At fourteen, he made his first sale. At age twenty, Harry made Lee General Manager, and in 1996, following Harry's passing, Lee became President of Scotland Motors. 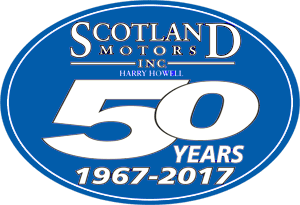 Harry Howell started Scotland Motors in 1967 with twelve cars on North Main Street in Laurinburg. 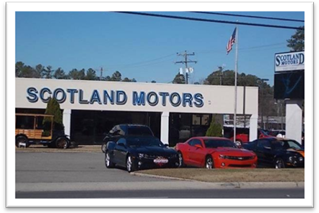 Scotland Motors eventually outgrew its original location and expanded to its current location at the heart of Laurinburg at 1609 South Main Street in Laurinburg, next to Highway 74 at Exit 184. Today we have a full service department available to handle all makes and models, and a car rental agency on site. 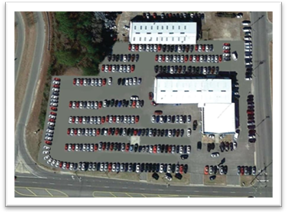 Today, at 1609 S. Main St., in Laurinburg, we have 400+ vehicles in inventory. Scotland Motors still operates on the founding values that Harry taught Lee: integrity, hard work, and giving back to the community. We believe in doing business in an upfront, honest and personal way. As Lee's father taught him: "Sell a good car for a fair price and give better service." Lee attributes the success of Scotland Motors to the company's founding values, to the support and loyalty of his customers, and the loyalty of his employees. Several of his customers are fourth and fifth generation customers, and some customers have moved away but still drive back from all over the country to buy their vehicles from Scotland Motors. Several of his employees have been at Scotland Motors for 25 and 30 years, and one has been here for over 40 years. On January 26, 2017, Scotland Motors received the Business of the Year award from the Laurinburg/Scotland Area Chamber of Commerce. In 2012, Auto Dealer Monthly recognized Scotland Motors in the Top 50 Independent Dealers across the United States. In 2010, Scotland Motors was awarded the prestigious State Quality Dealer of the Year by the National Independent Auto Dealers Association. 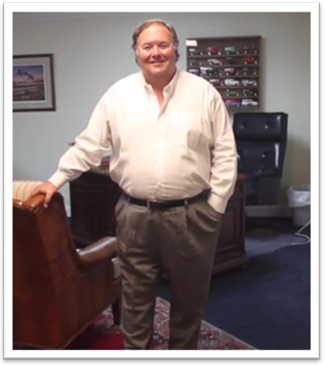 In 2009, Lee Howell received the Quality Dealer of the Year award by the Carolinas Independent Automobile Dealers Association. Today you can see Lee's daughters, Sydney-Lee and Kristin, carrying on the family tradition in the Scotland Motors ads seen on TV. Lee Howell, President of Scotland Motors. 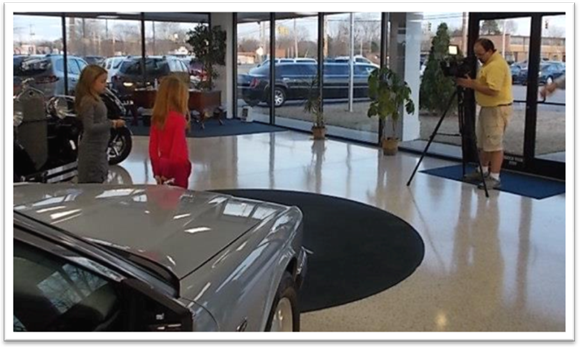 Sydney-Lee and Kristin Howell filming a commercial in the showroom of Scotland Motors. The company's success is due to the founding values that Harry taught his son, Harry "Lee" Howell, Jr., who is the President of the company today. We also know that our 50th anniversary marking half a century in business would not be possible without the faithful support of our customers and employees. For that, we extend our sincerest thanks!